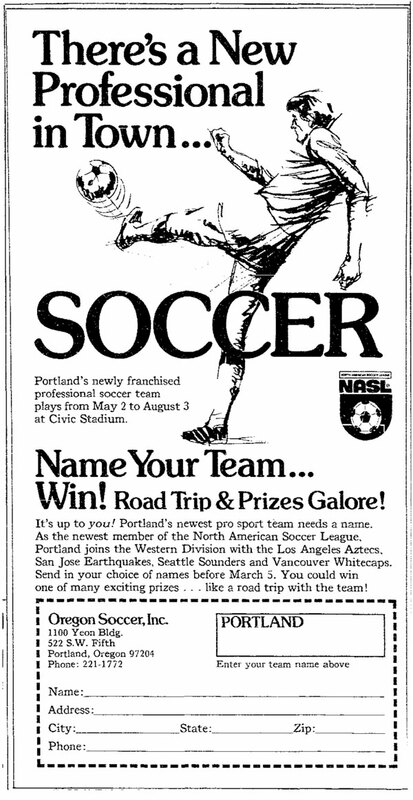 The stockholders of Portland’s nascent North American Soccer League franchise selected the team name Timbers on March 8, 1975 (Source: The Sunday Oregonian, 9-March-1975). The name was chosen from over 3000 submitted entries. Pioneers, with 157, had the most entries, but was rejected since Lewis and Clark College already used the name for its athletic teams. Some of the other finalists included Trappers, RainDrops, Stealheaders, Oregonians, and Volcanos. The Timbers name was submitted 12 times. Below is a copy of the entry form that appeared in The Oregonian from February 23rd through the 25th, 1975. Off topic. What is the name of that font? It was like, the emblematic font of the 70’s. Suddenly, I’m five years old and watching All My Children while my mom does the ironing.